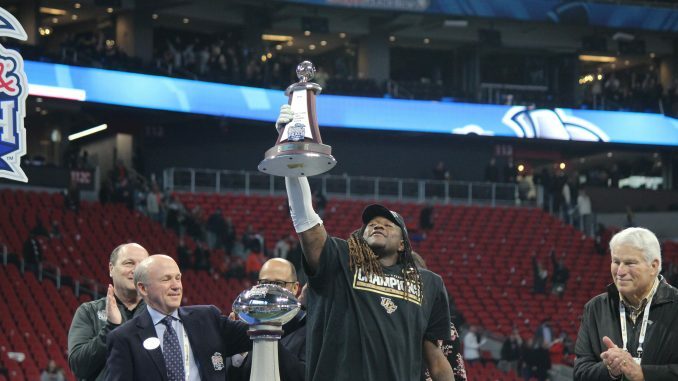 Shaquem Griffin hoists his MVP trophy towards the UCF fans after the Knights' Peach Bowl win over Auburn. After weeks of campaigning on social media and in interviews, UCF redshirt senior linebacker Shaquem Griffin has been invited to participate in the NFL combine in March. After having a standout senior season, Griffin turned heads at the Senior Bowl this week in Alabama, winning the Practice Player of the Week award. After it was reported that Griffin did not have an invite to the combine, many people took to social media and other avenues to advocate for Griffin. This included ESPN Draft analyst Todd McShay and San Francisco 49ers general manager John Lynch. With Griffin’s invitation, 28 UCF Football players have been invited to the combine since 1999.